Bamberg is an outstandingly beautiful city and also home of the Rauchbier (literally "smoke beer"), and so the visit here was one of the high points on our trip. It turns out that Bamberg has no less than nine breweries, so sampling all the Bamberg beers actually requires quite a bit of work. All of the breweries have their own taverns or biergartens serving the beer, and two also combine the tavern with an inn where you can stay at a very reasonable price. What makes the city so beautiful is not just the rich assortment of historic buildings, and the absence of modern eyesores, but also the location on the Regnitz river (and the Rhein-Main-Donau canal) underneath the Michaelsberg. The city is well worth a visit even if you don't care for beer at all. We bicycled into the city along the canal, which took us almost straight to the Fässla brewery inn. The inn is old-fashioned and charming, and the rooms are basic, but quite cheap. On the opposite side of the street is the Spezial brewery inn (closed at the time). The Fässla tavern turned out to have people drinking from it opened in the early morning (well, at least at 10 in the morning, when we got up) until it closes. You'd have a hard time selling beer at 10 on a Thursday in Norway, but apparently not in Germany. One nice thing about Bamberg is that it's quite small (70,000 inhabitants, according to Lonely Planet), so you can easily walk everywhere, which is what we did. Our first stop, unless you count the sightseeing en route, was the Schlenkerla tavern, which is right in the historic centre of town. 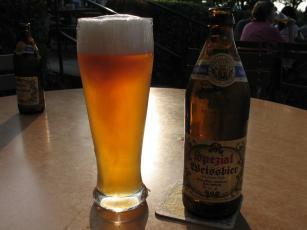 Schlenkerla is the best-known of the Bamberg breweries, and their Aecht Schlenkerla Rauchbier is widely distributed (466 ratings on RateBeer). Rauchbier is brewed in the same way as other bottom-fermented beers (like pilsener); the difference lies in the malts that are used. When brewing beer one doesn't simply use grain, since grain consists mostly of starch, which the yeast can't eat. The solution is to make malts from it, which is done by starting the growing process in the grain (which turns the starch into sugar, which the yeast can eat), and then stopping it by drying the grain. It's the drying that is the key here; one of the ancient drying methods was to use an open fire, which naturally subjects the malt to smoke, which flavors the malt. The rauchbier brewers do this on purpose, which is what gives the beer the intense, smoky taste. Usually breweries get their malts from separate maltings, but the Bamberg rauchbier brewers produce their own malts in order to smoke them. I think most people who are not used to beers with a lot of flavour probably will find the rauchbier somewhat challenging. People in Bamberg say you have to drink five liters before you start to enjoy it; whether this is true I can't say. I enjoyed my first pint (in Oslo, a couple of years ago), and my girlfriend considered tasting from my glass more than sufficient exposure to rauchbier. The Schlenkerla tavern also serves local Franconian dishes, which are excellent. They also sell bottles in the tavern, so you can take some with you. We didn't do this, since there's more than enough beer to taste everywhere in Germany. 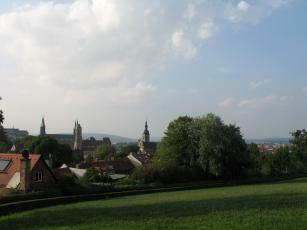 Anyway, we walked through town and found the Spezial bierkeller up on the hill with a lovely view of Bamberg. It may sound strange that a cellar has a nice view, and we said as much to the waitress. She laughed and told us that they served the beer on top of the cellar, not in it. So the bierkeller is actually a biergarten, with the cellar underneath it, and this is the usual arrangement, at least in Bamberg. In fact, they told us the cellar was huge, stretching under the entire biergarten plus the adjoining meadow. Spezial is the other Bamberg brewery which makes rauchbier, and their range is very similar to that of Schlenkerla. Again, without tasting notes I can't say much about their beers, unfortunately. There turns out to be another huge bierkeller, called Wilde Rose Keller, with gravelled grounds, a stage, and simple snacks, just above the Spezial, where we had a very nice kellerbier from the house brewery. This brewery seems to have no distribution outside the tavern, as there are only 1 to 4 ratings for each of their beers on RateBeer. Below these two, on the same hill, is the Mahrs Bräu tavern, which is a collection of old wooden buildings, one of which serves as the tavern, with a nice and very quiet restaurant. The food was OK, and I seem to recall the beer being quite good. This brewery is listed with 15 beers on RateBeer, but the tavern only had two. Not sure why, but in most of the taverns you couldn't get the full range from each brewery. Some beers would be seasonals (bocks, only available in late winter), some would be sold out, and some they would just not serve, for reasons never explained. Back in town we stopped by the Klosterbräu tavern, which was a sagging, half-timbered building. This seemed less touristy than the others, and more like a local. We tried their schwarzbier (boring, as I recall, but RB-ers seem to like it) and the weissbier. This was more than enough beer drinking for one day, so we stopped after this, and went back to the Fässla brewery to sleep. At this point we'd tried five of the nine breweries, and we knew where the sixth was, but were clueless about where the remaining three might be. Lonely Planet does not even mention them, and neither does Michael Jackson's pocket guide. Next morning we walked around a lot, but completely failed to find them, and in the end resorted to the tourist information. They told us that there were three out in Wunderburg, which is a part of Bamberg near the Fässla, further along the canal. 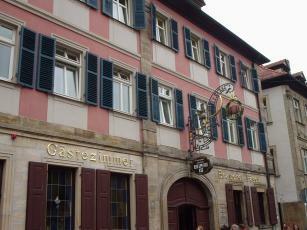 In the evening we went to Wunderburg and found Keesmann, which was very local, and also turned out to be an inn. Very nice, but only two beers: a pilsener and a lager. The lager was quite dark and very good; lots of taste. The other brewery tavern turned out to be Mahrs, which we'd already visited on the hill, but here they had a much wider selection. The last brewery out there is the Maisel (not to be confused with the Maisel of Bayreuth), which we never got to, since it got too late, and they closed. On the second day the city was getting ready for the annual Sandkerwa festival, and rapidly filling up with tourists, so we decided to get out. The following day we got up early and biked out of Bamberg to the northeast, through "the Franconian Switzerland" towards Kulmbach. On the way we passed through a small town called Memmelsdorf just outside Bamberg, which turned out to have four breweries. We stopped at the Drei Kronen brewery inn, which looked very pleasant, and bought a bottle of unfiltered rauchbier, which we took with us for lunch. Just after Memmelsdorf we came to Scheßlitz, which had three or four breweries. After that we passed into "the Franconian Switzerland", about which more later. More internet research here at home reveals that the last brewery is Greifenklau, which is also up on the hill with the Spezial keller somewhere. Also, since August 2004 there is a tenth brewery: the Ambräusianum, near the Schlenkerla, which has three beers (no rauchbier). The Franconia Beer Guide has all the details, plus some bits we didn't find. 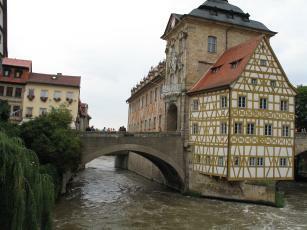 Another excellent guide is Ron Pattinson's Bamberg Guide. 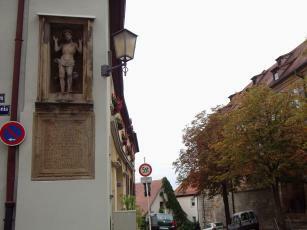 Also, don't just go to Bamberg; make sure you get to look at the small towns around it, too. 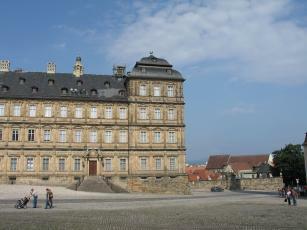 Memmelsdorf and Scheßlitz stand out, but I'm sure there's more to be found. And if you really want to be thorough you'll definitely need more than two days. I don't know if you are aware of this, but the Bamberg tourist office (http://www.bamberg.info/ does indeed offer a guide to local beer. In fact, they have a special packet (�20) specifically for beer tourists that, in addition to the guidebook, includes a backpack with a beer mug (krug), beer coasters and a coupon for five beers of 0,5L each. Thank you for this information, Mike. I was indeed not aware of it. The tourist information neglected to tell us about this, but I guess they skipped it since our question was so specific (where are the three remaining breweries?). Or something. I don't know.